Do You Need Help with your Public Relations? Do you want to see your products and services in the media? EditShare XStream EFS shared storage solutions will now feature ACL Media Spaces as well as enhanced storage space utilization reporting. The big attraction of ACLs is the fine-grained control over user permissions. While EditShare has traditionally focused on keeping storage management tools simple for creative users, 'power-user' administrators who are more accustomed to SAN storage and Windows-NT style controls will appreciate this new addition. 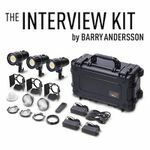 Light & Motion announces the release of three new compact, powerful, and rugged, travel-friendly professional kits. Combining features of the most powerful Stella Pro single point LEDs, each kit is designed to support capture of highquality content for professional interviews, broadcast news, and expeditionary adventurers. With Limelight’s new WebRTC-based live streaming solution, video can be streamed from anywhere in the world, to anywhere in the world, with less than one second of latency using open and scalable technology that’s supported on standard web browsers without the use of special plug-ins. 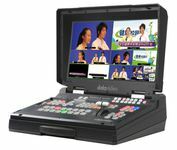 Internet video new s- NAB 2018 - The HS-1300 is a cost effective, all in one 6 channel hand-carry mobile studio with built-in streaming and recording capabilities. It has all the same great features of the HS-1200, with the addition of a built-in H.264 encoder for streaming. Therefore, the workflow is simplified because it is no longer necessary to add an external encoder to do streaming. Simply connect the HS-1300 to a network and begin streaming your program to your preferred CDN. In addition to the streaming capability, the HS-1300 can also record the program output to a USB drive. The Streambox NODE is a small form factor media player device supporting ten programmable video channels which will automatically “pull” live video from Streambox Cloud and Enterprise Server or directly from an encoder for live video playout to connected TVs & monitors. 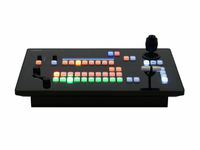 The new Panasonic AV-HLC100 Live Production Center combines a 1 ME switcher, remote camera controller (up to eight cameras), graphics overlays, streaming/recording and audio mixer functions to enable easy live streaming with one-person operation. NewTek announced integration of Viz Mosart, Vizrt’s studio automation solution, with TriCaster® TC1 and NewTek IP Series live production systems. The product of a tight relationship between two industry-leading companies, the integration will streamline workflows for broadcasters, digital content publishers, and corporate video producers, bringing a new level of ease-of-use, consistency, and quality to their productions. The integration provides access to cost-effective production with full automation using NewTek’s NDI® industry-standard IP transport mechanism. Zoom North America is now shipping its new F1-LP Field Recorder + Lavalier Mic system for videographers, vloggers, and journalists, this portable recorder and mic package provides the ability to record professional-quality audio, no matter how far away the video subjects are from the camera. Unlike wireless beltpack systems, the lavalier mic connects directly to the F1 field recorder and records to a micro SD card, eliminating any interference or noise that could be caused by wireless signals. NAB Show will present “’Star Wars: The Last Jedi’: Join the Rebellion,” a Main Stage session featuring key members of the team from Lucasfilm’s VFX and animation studio, Industrial Light & Magic. The session will take place in the North Hall of the Las Vegas Convention Center on Wednesday, April 11 at 2:00 p.m. The online sports industry will be explored in a new conference titled “eSports: Get in on the Action” on Wednesday, April 11 as part of the 2018 NAB Show in Las Vegas. The conference, which is produced in partnership with the eSports Ad Bureau, comprises six sessions focused on audience targeting and growth, sponsorship opportunities and real-world success stories. Rotolight Unveils NEO 2 - A revolutionary all-in-one High Speed Sync flash and continuous light for photographers and filmmakers. NEO 2 can be simultaneously a continuous ‘modelling light’ and HSS flash, allowing the photographer to easily acquire focus in dimly lit situations and optimise composition. New media -- whether it’s a song, film, website, book, video game, or other type of media production -- faces an uphill battle. 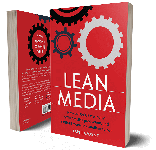 In his new book, LEAN MEDIA: How To FOCUS Creativity, STREAMLINE Production, And CREATE Media That Audiences Love (press release below), digital media expert Ian Lamont lays out the Lean Media framework which can give creative professionals and media businesses an edge -- helping creators hone their processes, lower costs, reduce the risk of failure, and ultimately create compelling content that resonates with audiences. Spoofdance 2017 Film Festival Finally here’s a chance to make fun of your favorite (or least favorite) TV commercials. 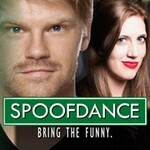 The aptly-named Spoofdance Film Festival invites you to create 15-second parody ads by Sept 30. The best parodies win film gear & film training from Glidecam, Azden, MZed, F&V Lighting, Zacuto & more!